The What: Atlona is now shipping the AT-UHD-CLSO-840, an eight-input, four-output 4K HDMI and HDBaseT matrix switcher built for videoconferencing, multi-screen presentations, and divisible room installations. The matrix switcher will be demonstrated at ISE stand 5-S92 from February 7-10 at the RAI Exhibition and Conference Centre in Amsterdam. The What Else: The new matrix is equipped with five HDMI and three HDBaseT inputs, two HDMI outputs, and two HDBaseT outputs. It is envisioned for use in a variety of meeting room settings, such as videoconferencing suites requiring at least three independent outputs for connections to displays and a conferencing codec. The CLSO-840 integrates into an audio system with DSP, through an independent 8x4 audio matrix that routes de-embedded HDMI audio to analog audio outputs, with gain control and EQ also available. There are also four analog audio inputs, each dedicated to embedding content onto a corresponding video output. The new matrix includes ethernet and RS-232 connections for third-party control. It can extend ethernet from a control processor, and features IP to RS-232 translation for converting TCP/IP commands to RS-232. This provides the flexibility of extending TCP/IP or RS-232 control to remote devices over HDBaseT. System integrators further benefit from the Atlona Management System (AMS), a network software platform for configuring, managing, and monitoring the CLSO-840 and other Atlona IP-controllable devices over a LAN, WAN, or VPN. AMS is available free from Atlona, and helps streamline installation and maintenance of several Atlona products throughout a facility or enterprise, from a standard web browser. 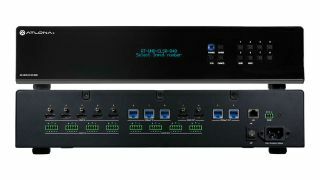 The Bottom Line: The CLSO-840 offers both local and remote inputs and outputs for flexibility across AV formats and connectivity options, providing a powerful matrix solution for classroom, corporate, and hospitality environments. It is available now for $4,999.99 MSRP, and includes Atlona’s 10-year limited product warranty and customer support services.